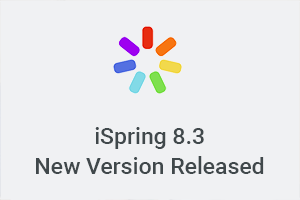 Today the advanced iSpring 8.3* has been released! The coolest enhancement is part of the TalkMaster tool, which now allows users to record voice overs for characters. With this new option, dialogue simulations are even more realistic than ever before! 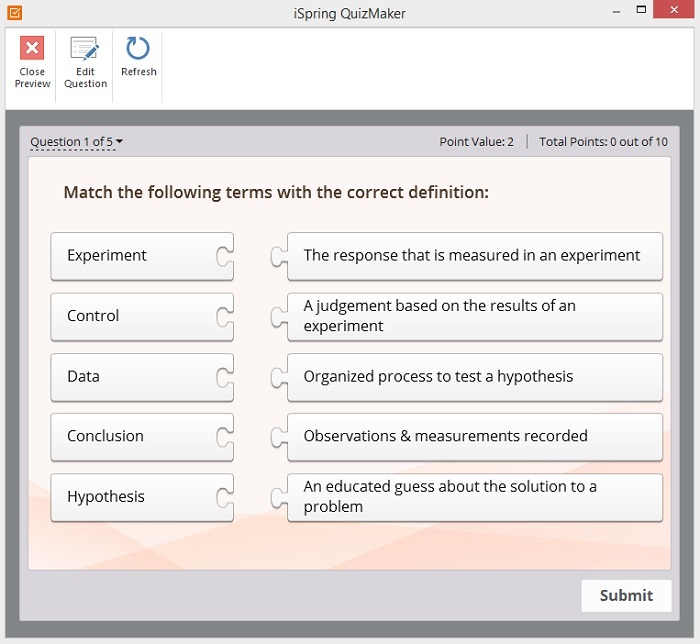 Audio narrations can also be recorded with the QuizMaker tool now, which is available as a component of iSpring Suite. To learn more about these and other enhancements, read this article. 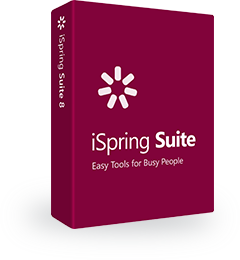 *If you already use iSpring 8, the new iSpring 8.3 is available for you totally free of charge under your complimentary Maintenance Plan. 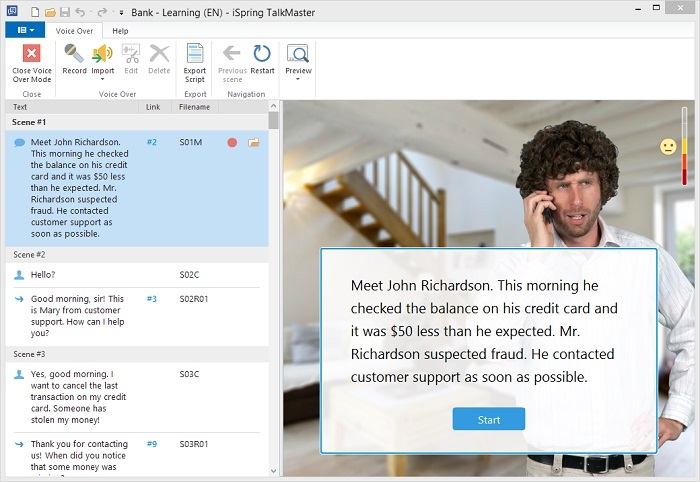 The silent era of conversation simulations has come to an end, as you can record voice overs with iSpring TalkMaster, a built-in component of iSpring Suite. Listening to an interlocutor (rather than just reading his lines) helps train speech perception skills, which are critical in real-life communication. After you’ve created a conversation script, you can record voice overs for the character(s) and reply options. If desired, you can even provide feedback messages with audio too. In case you want professional voiceover actors to record all the narrations for you, simply use the Export Script option – it will save the whole script as a .doc file. The voice overs need to be saved under the filenames indicated in the script. Once the voice overs are ready, you’ll be able to use the Bulk Import option. All the audio files will be added to the corresponding scenes automatically. Well-designed interactive tests not only assess how much students have learned, but provide opportunities for them to learn more. One way to turn your quizzes into an effective tool for teaching, not just measurement, is to create and customize feedback messages. This is easy to do with iSpring QuizMaker 8.3, which is integrated into iSpring Suite. Add images, audio and formulas to feedback messages. 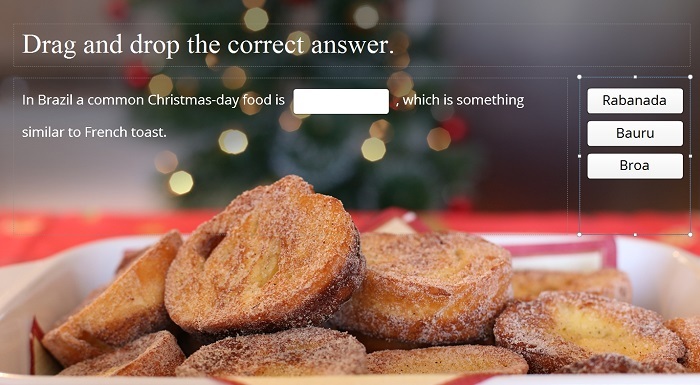 Tell why the chosen answer is either right or wrong, and illustrate your ideas with explanatory images, formulas, sounds and even audio narrations that can now be recorded and edited right in iSpring QuizMaker. Set default messages for the whole test. If you don’t want to design specific feedback messages for different answers and questions, simply create two basic messages: one that will be displayed whenever the right answer has been chosen, and another to be displayed when a student makes a mistake. Turn feedback messages off when they’re not needed. Sometimes, you may not want your students to know the right answer immediately (e.g., on online exams or final tests). In this case, you can easily turn feedback messages off, and later turn them on again when needed. Customize the color scheme of your feedback messages. Apply one color to the top bar of the correct answer feedback (as a rule, green), and another one for incorrect answer feedback (as a rule, red). One more piece of good news is that your students also benefit from the 8.3 update, as they can now hide feedback messages and return to the question slide at any time. It’s now possible to record and edit voice overs right in iSpring QuizMaker. This feature is essential when you want your students to hear the question instead of reading it (e.g., for assessing listening skills in a language test). 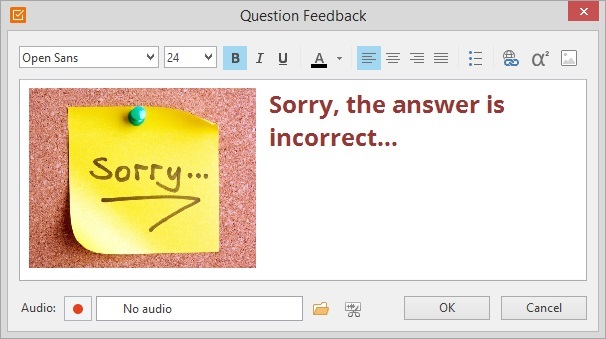 You can record an audio narration for a question slide or even a feedback message. The recorded and imported audio tracks can be fine-tuned with the built-in audio editor, which removes background noise, deletes fragments of audio, and much more. The proportion between premises and responses in the Matching question can now be easily modified. This means that even a long text (e.g., an extensive definition) in the response field will fit in. The text display has also been improved in the Sequence question type. 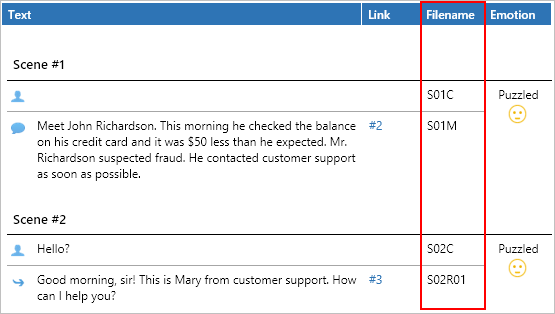 The fill-in-the-gap text and reply choices in the Word Bank Question are now separated into two different fields, which can be moved and resized in any convenient way. Feel free to choose one of the 36 new beautiful color themes to make unique, visually-engaging quizzes and surveys. Now you can adjust your microphone right in iSpring products, without running any additional setup utilities on your computer. 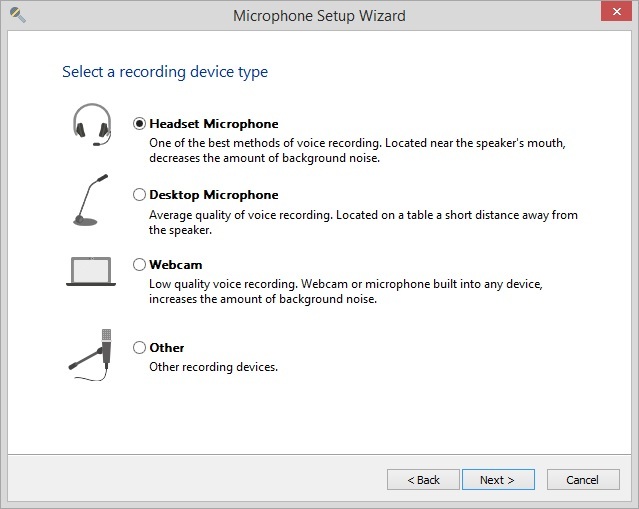 Whenever you need to record an audio narration, the built-in microphone setup wizard will help you choose the optimal recording device, and easily adjust it.